Wow... Wow.... My baby is crawling! The eleventh month is full of crawling only. I'm bit relieved to know that she is able to crawl and finally she achieved this development milestone too! But it was all our mistake to sit near by and show toys on top of her face. As she started crawling, we showed some of the interesting things to her to boost her crawling. This is how I pas time at home!! Wondering why am I this much happy??? Everybody at home were thinking that she will not crawl but directly walk. I won't be happy this much when she gets ready to walk! Because I know that she will be able to walk in another one month! These days she likes to stand much than sitting. Most probably on her first birthday she must be walking. We had been to my friend's daughter Evelyn's birthday party. We started early but because of the route confusion :-( we reached very late. But had very nice food!!! Thanks Preetha & family for the nice dinner. I'm started potty training to her and she voluntarily does that in the morning. 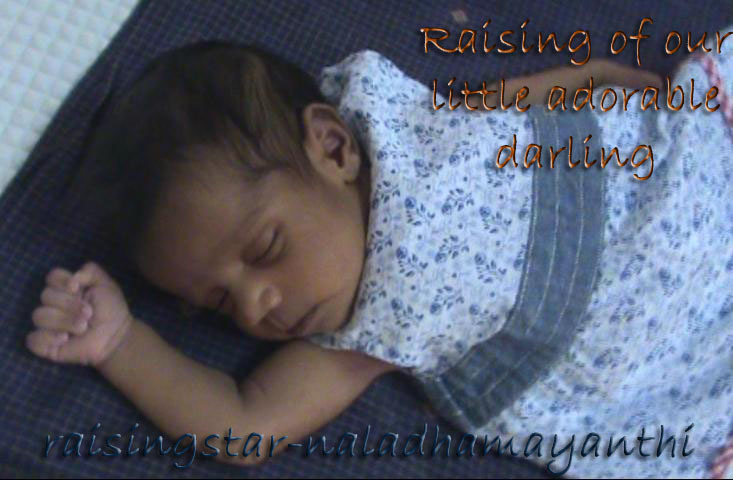 As she is too small to call us and tell, we make her to sit potty once in 2hrs or depends. But she is very happy to use it. 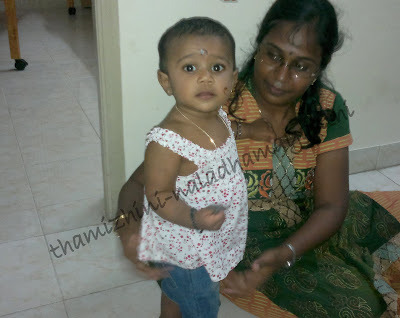 She likes to imitate us whenever we do something and understands very well if we ask something to her like, come here, give it to me, see there, where is amma, appa, where is Thamizhini's photo, where is amma's painting and so many things. She might forget sometimes but we ask her now and then to remaind her. 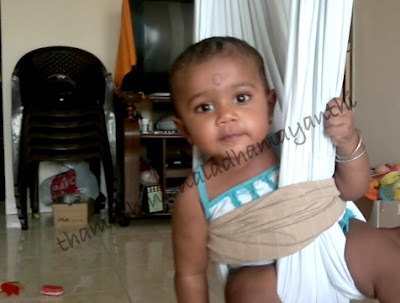 I'm sure you have already seen Thamizhini's Mimicry, Dancing, How she reacts if we ask her to "Come Here""Come Here" and of course how she helps me when I give bath to her!!! If not, go and check it out right now.